DinghyGo make innovative inflatable dinghies that can be motored, rowed, AND SAILED. 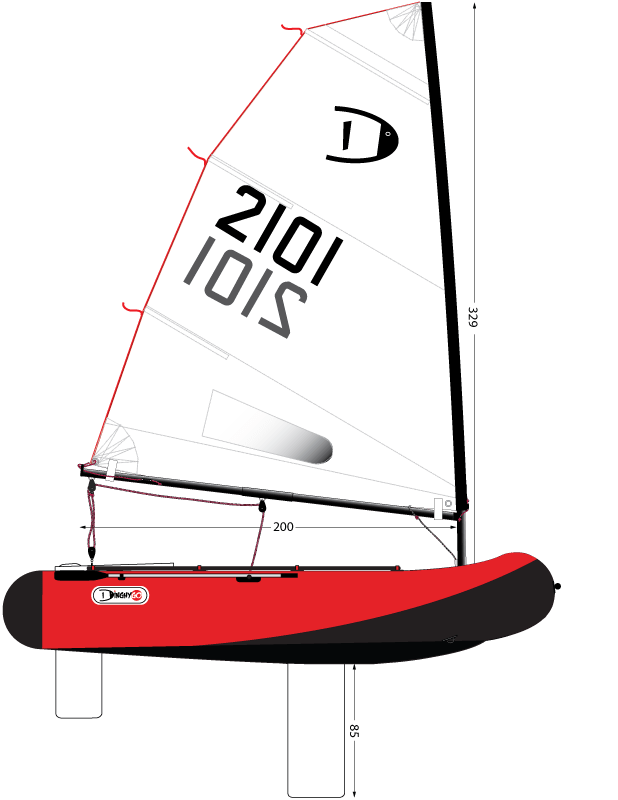 Unlike some previous sailing inflatables, the large, deep, and central daggerboard (keel) means they make good progress to windward, and the free-standing mast makes assembly quick and easy. 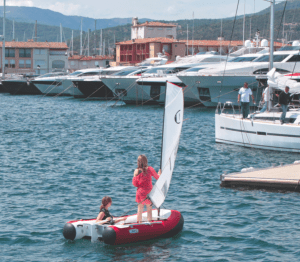 When used without the rig, they also work well as great quality inflatables for everyday use, with excellent stability, huge carrying capacity and the ability to plane under power, using motors up to 6hp. DinghyGo is available in three sizes: the NEW for 2018 black and white Orca, at 3.25m (10ft 7″) long; the red and black Nomad, at 2.75m (9ft) long; and the updated (now red and black) Nomad S, at 2.3m (7ft 6″) long. 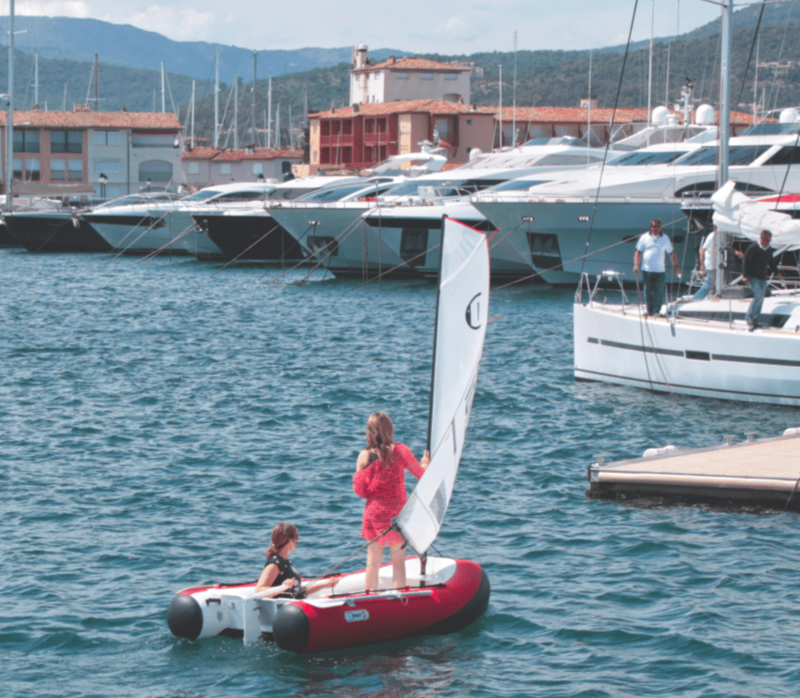 All sail surprisingly well for sailing inflatables but the Orca 325 is the most “sporting” of the three. 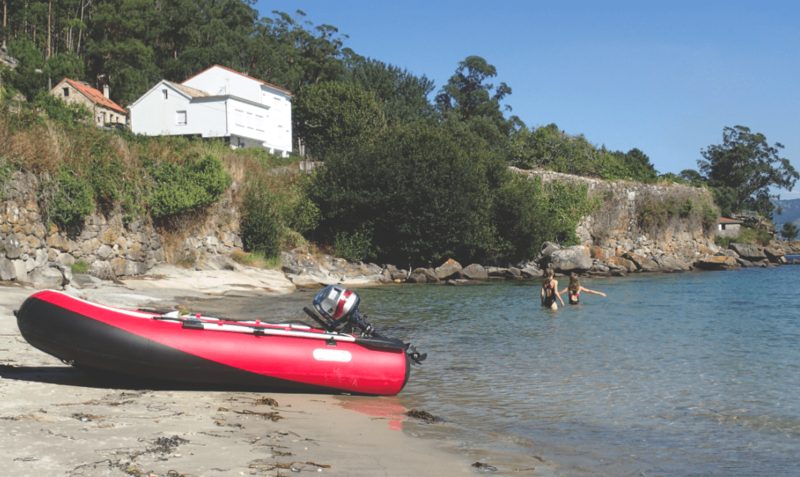 The Nomad 275 is an updated version of DinghyGo’s most popular size, a good all-rounder and often chosen by yacht crews seeking a practical tender (capable of carrying four adults in motoring mode) with an added element of fun. The Nomad has also proven popular with motorhomers. 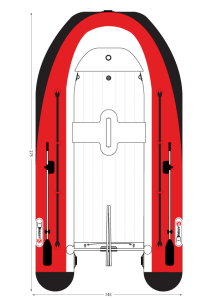 And lastly the Nomad S 230 is two foot shorter than the Nomad; that makes it a bit lighter and great for adults sailing alone, or sending a couple of kids off for an afternoon of Swallows & Amazons type adventures. Again, with the rig off, the S is a capable general purpose tender for 2-3 adults. Nestaway Boats Ltd is the exclusive UK distributor for DinghyGo products. 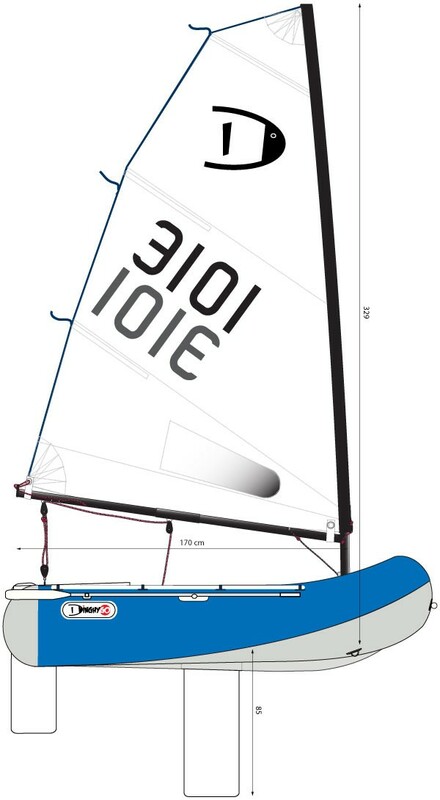 The sailing rigs have sectional aluminium spars, such that the packed length is only 125cm (4ft 2″). 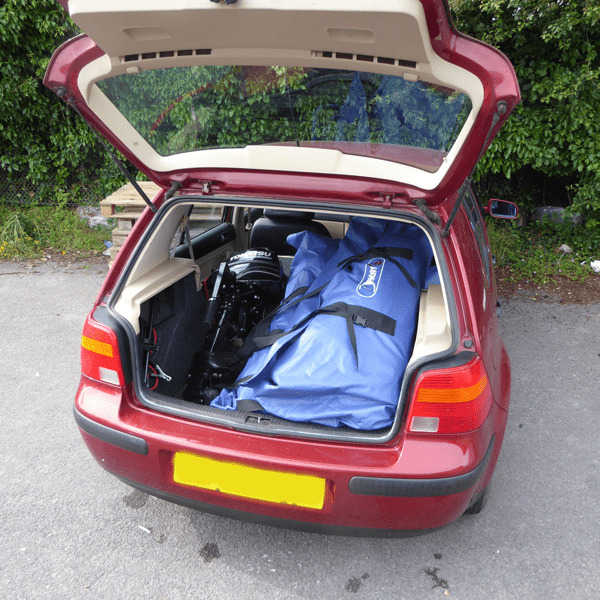 The hull bag is shorter still, so it shouldn’t be difficult to find somewhere to store your DinghyGo, whether it’s on a yacht (in a locker, down a quarter berth); in a motor home (on a spare bunk, or in rear “garage” if available); or at home (shed, garage, perhaps even an under-stair cupboard!). 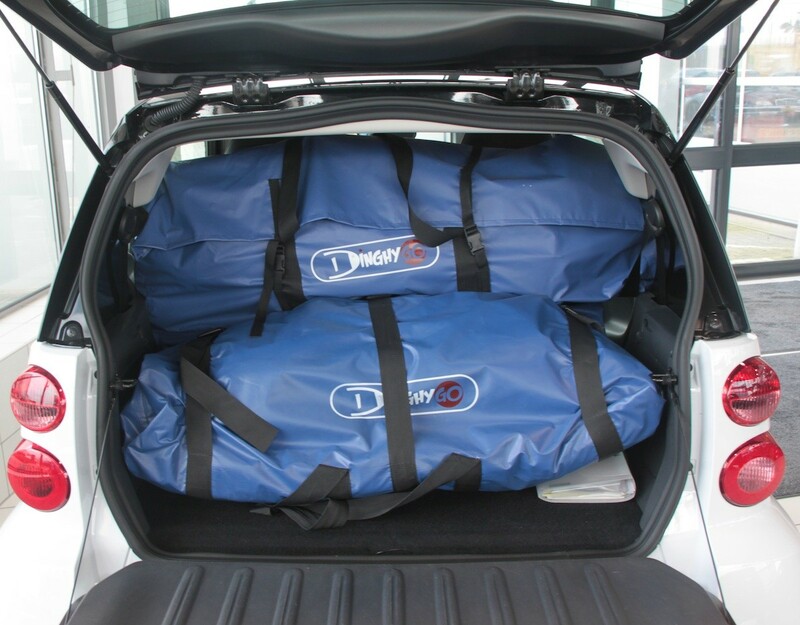 As for transport, here you can see the two packed bags for a DinghyGo 275, together with an outboard, in the back of a VW Golf hatchback. NB These were “real world” packed sizes, not vacuum-packed from the factory! 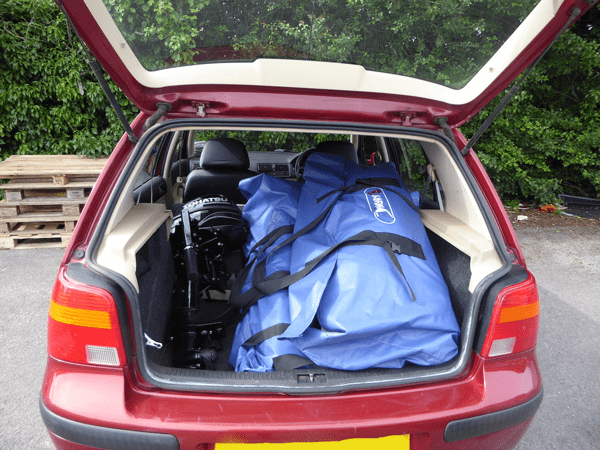 The compression straps on the hull bag aid greatly with expelling the air from the hull. 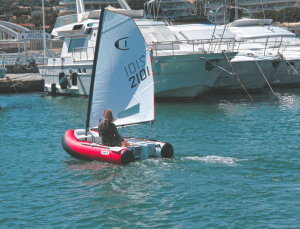 This ability to fit in two compact bags makes them “the world’s most portable sailing craft“. 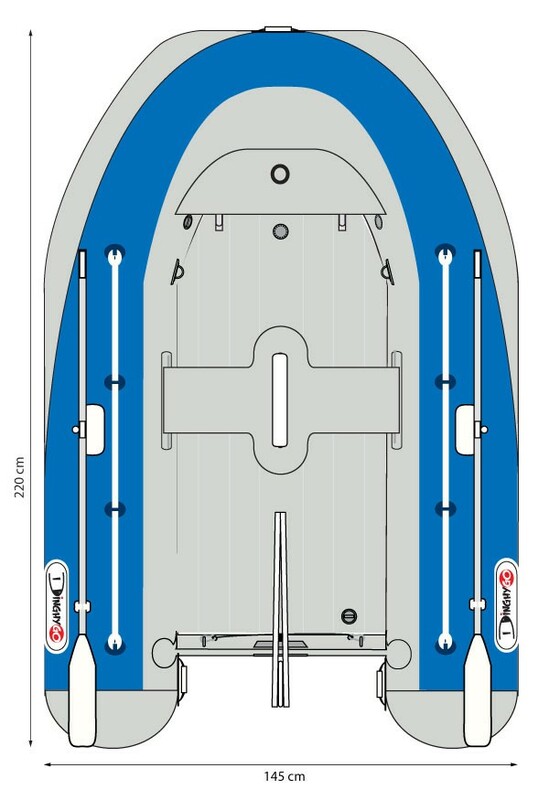 The heaviest package (which is the 9ft hull) is only 26kg: most adults can lift that on their own, and it’s easy for two. 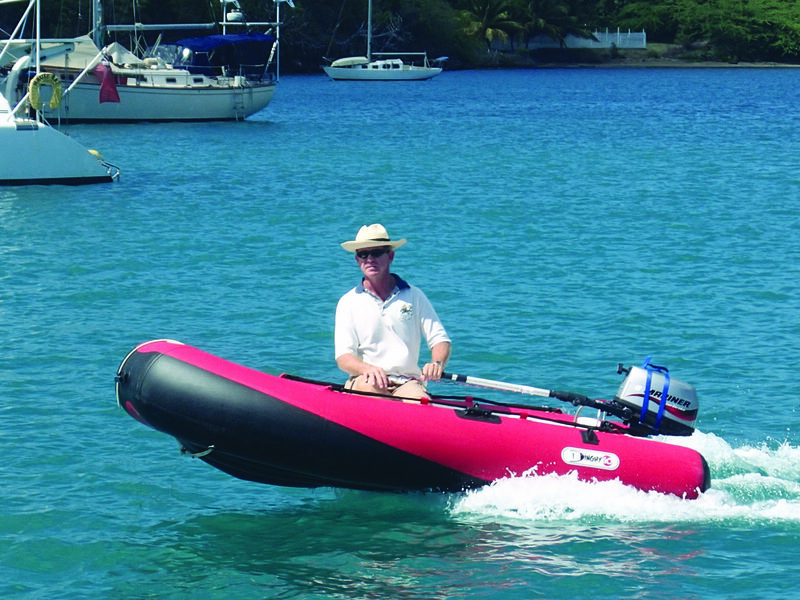 DinghyGo 2 on beach, in motorboat mode – she will easily carry a family of four. The DinghyGo is a high quality, well-built general-purpose inflatable dinghy that can be rowed, motored and sails remarkably well. 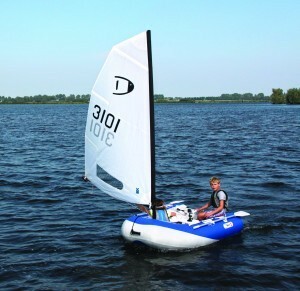 Many UK customers will be reminded of the popular Tinker Tramp & Traveller range – DinghyGo is their spiritual successor. 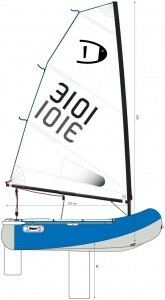 But the sailing rig is much quicker and easier to set up, as it doesn’t require any supporting wires. 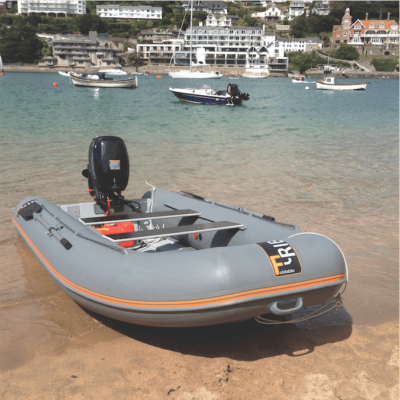 Design/materials move on: we actually think it’s a better general purpose dinghy/tender, too – and it’s significantly lighter (275/9ft compared with Tinker Tramp). 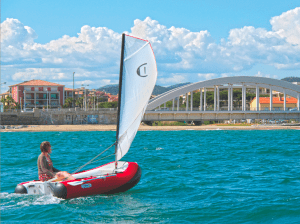 DinghyGo is rated Category D, ie: Wind Conditions up to force 4 on the Beaufort scale (max 28kmph); and significant Wave Heights up to 0.3m with occasional waves of up to 0.5m (eg from passing vessels). 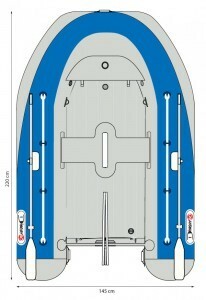 A self-bailer is fitted in the transom, to empty out any spray etc you may take on board while motoring at speed. Perfect Conditions: blasting along on a broad reach! 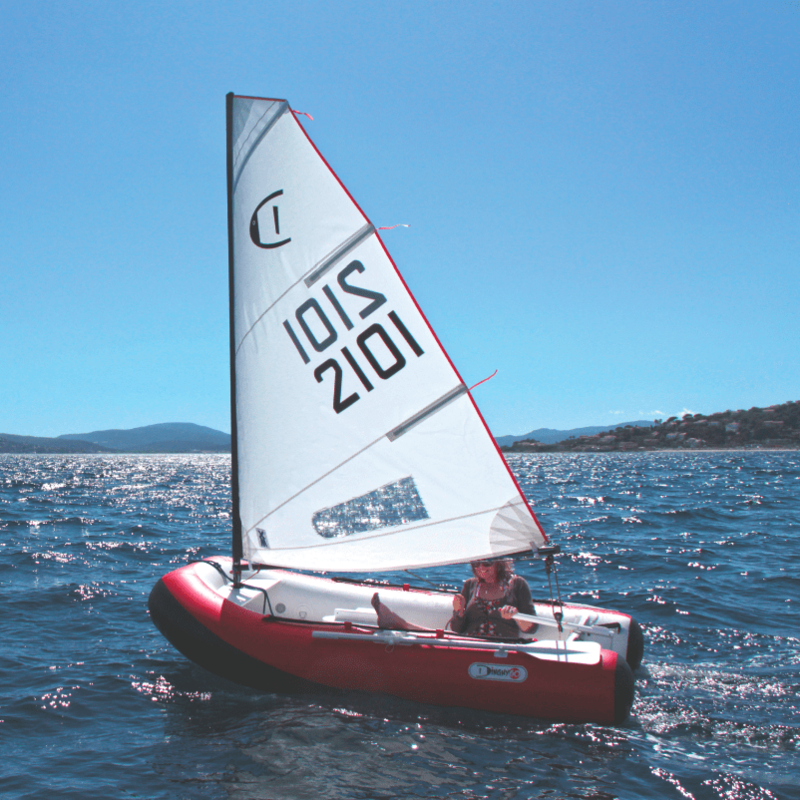 “she made decent headway to windward – not always the case with sailing inflatables… a true all-rounder”. The phenomenal stability is also very reassuring, especially when we were first testing one ourselves, in the winter months! 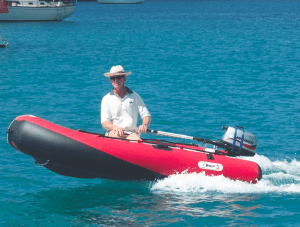 Under power, DinghyGo will plane one-up with motors of 4hp (as seen here) and larger… Put 8hp on the back, and she’ll turn into a rocket ship! 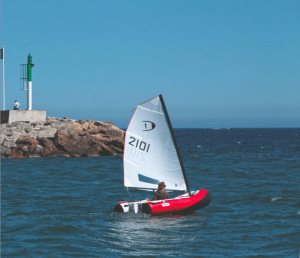 Sail with Confidence: DinghyGo’s central daggerboard and rudder make for easy and precise handling in close proximity to other boats, mooring buoys, pontoons etc. 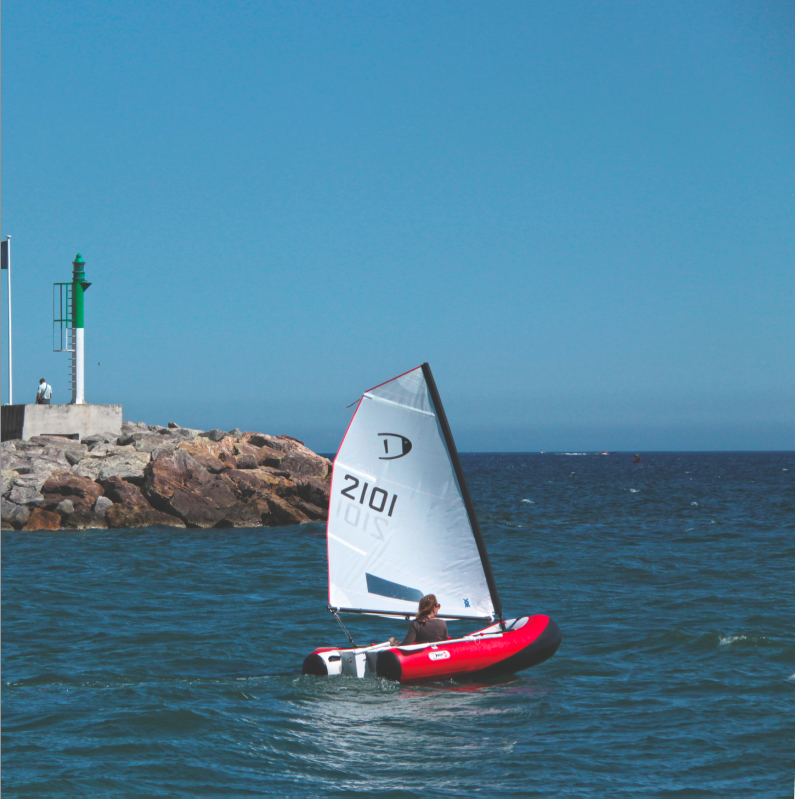 DinghyGo 275 provides comfortable and reassuring stability. 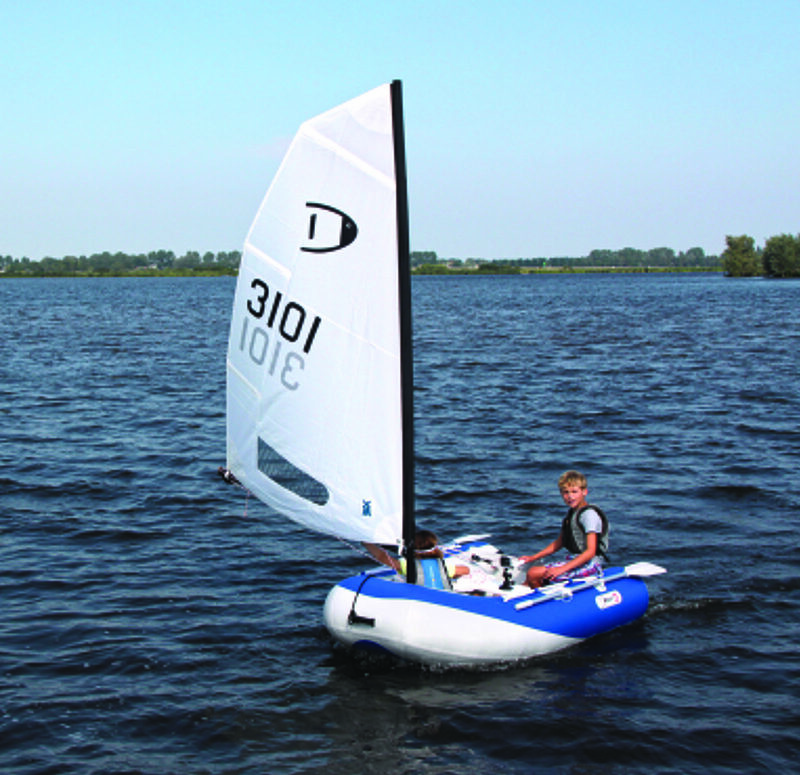 DinghyGo S is simple to sail, even for children. 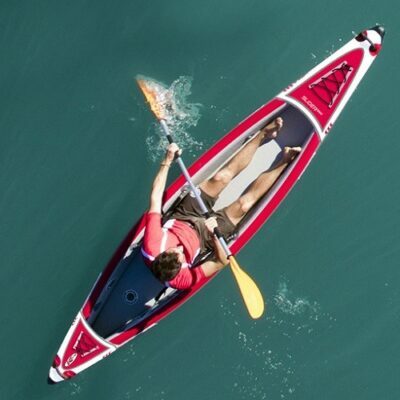 The superb stability is reassuring (for both kids and parents!). 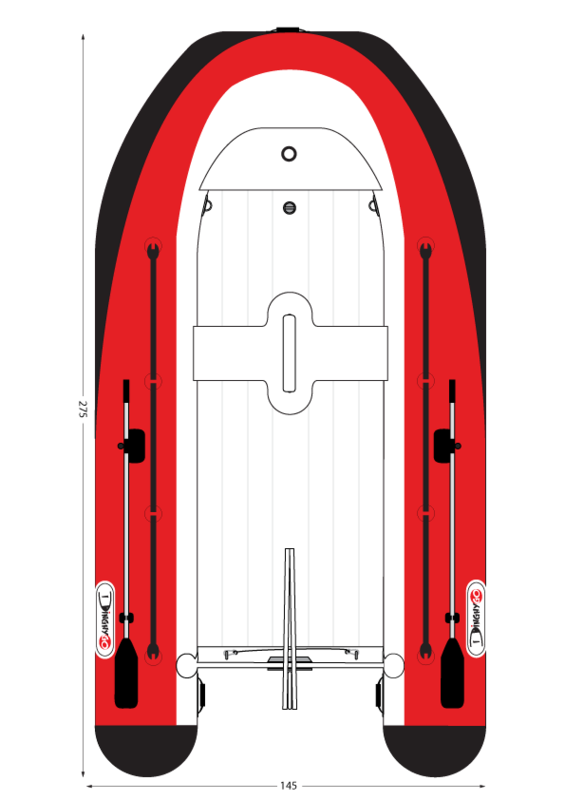 The side-mounted oars are out of the way but always there if the wind drops to nothing, or they end up too far downwind/tide!